This is Chong Chong’s first hong bao, given to him when he was a week or so old by some friends of Shanshan’s mother. Chinese typically do not have baby showers, but instead celebrate a series of milestones after the baby’s birth. Here in the north, 30 days and 100 days of life are marked. We’ll be having a very small gathering for 30 days, with 100 days being a somewhat bigger event. And, although gifts are given, guests will mostly bring hong bao. 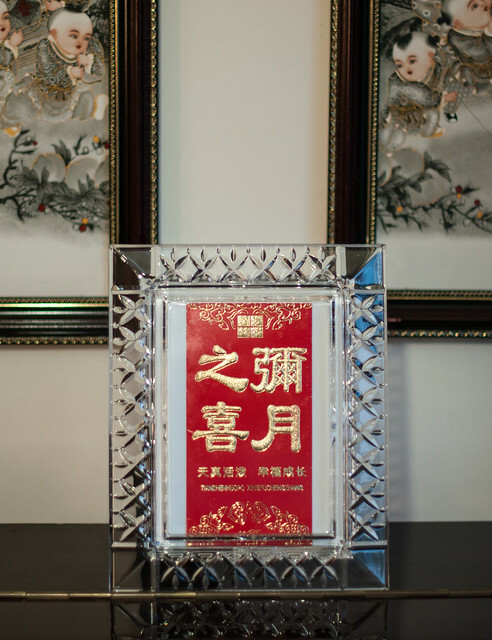 This marks the start of giving and receiving hong bao, both to celebrate special events and to influence/be influenced by others. – The friends I mentioned above, like Shanshan parent’s, are Beijing people who served well over a decade in Inner Mongolia during the Cultural Revolution. – The hong bao’s home is temporary. The frame, made of genuine Irish crystal, and given to us by a friend (who also happens to be genuinely Irish), will be have a picture of Chong Chong in it at some point. beautiful rituals for parents and child and the whole family. and the crystal frame from your friend will be wonderful to hold a photo of chong chong. Such intersting differences in traditions.